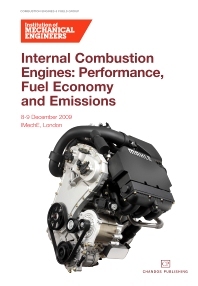 This book contains the papers presented at the IMechE’s Internal Combustion Engines: Performance, fuel economy and emissions conference, held at the IMechE, London, 8-9 December 2009. This conference, the latest in the successful biannual series on internal combustion engines, addresses drivers of change, technological developments and advances in the latest research. It examines developments for personal transport applications, though many of the drivers of change apply to light and heavy-duty, on and off-highway, transport and other sectors. The conference focuses on spark ignition engine technology for fuel economy, engine downsizing design and analysis, diesel engine design and analysis, and fuels. The papers are arranged under the following headings: SI Engines - Technology for fuel economy; SI Engines - Downsizing, design and analysis; Diesel engines - Design analysis; Emissions control - NOx and particulates; Fuels and diesel engines; Low-temperature combustion; Fuels and SI engines.